The onrushing deluge of social media options for wine commentary and review has made it imperative, I would argue, for each and every person who elects to adopt the role of critic/commentator to explain her or his basic operating principles. By that I mean, give your readers/viewers some idea of the basic criteria that you apply to the task. There are no set or fixed “rules” other than this – the individual should have some personal guidelines, goals, standards, a methodology if you will, and should be able and willing to describe it accurately. The print publications and newsletters that do the more formal scoring and critiquing all impose such guidelines on their editors, and I believe it’s helpful to their followers. But as a soloist, rather than a member of any particular orchestra, you really have to set your own program. I’ve been at this awhile, and I have developed a methodology that works well for me. I have done my best to explain it right here in this blog, and also through the countless columns and reviews I’ve contributed to the various publications. One of my personal tenets is this: give young wines adequate time to show themselves. This is a challenge that I have not seen discussed very much, but it’s important. Most reviewers (and especially the leading score-oriented publications) are in an unspoken competition to be first to review a wine, a winery, a vintage. It’s the nature of the game. Along with that is the marketplace reality that those in the business of making and selling wine are generally eager to move on to the newest vintage as quickly as possible – it just makes good business sense. As a result, most reviewers are tasting wines that are painfully young. In many instances they have only recently been blended and bottled. They may be suffering from bottle shock. If not, they have often been shipped, sometimes more than once, and that can shake them up. But even if none of that factors in, some young wines simply refuse to open up quickly. They may require hours or even days before they budge. Just yesterday I looked over the results of yet another wine judging that claimed to recognize outstanding wines from all over the world while studying the effects of terroir on wine quality. I was not a participant in this event, but of course I headed right to the listing of Washington winners to see how the state fared. I don’t know who entered and came away empty-handed, but I couldn't help but note that among the winners was one particular Walla Walla winery whose wines I know from extensive personal experience age beautifully, but are quite often impenetrable upon release. This winery got the door prize – a bunch of bronze medals. And I wonder if it was because the judges had to slam through flight after flight, with little or no time to let the wines breathe and really show their best? This is why I prefer to taste wines at home, in a totally controlled environment, with and without food, over a period of hours or days. On Monday I was fortunate to sit down with Bob Betz and taste the new Betz Family releases; yesterday I did the same with Brian Carter and tasted through a selection of his Brian Carter Cellars wines. In both instances I revisited the wines many hours later, and found that they had benefited from the breathing time. My two favorites – one from each winery – are both wines that clearly will do well with additional bottle age and cellaring. They are just now about to be released, and are in limited supply, so if you are interested in either of them, I suggest you contact the wineries for purchase information. Betz Family 2007 Père de Famille Cabernet Sauvignon ($60). Bob Betz believes this is the best wine he has ever made, and I would not disagree. Shut tight when first poured, it grudgingly opens in the glass – a dramatically dark, dense, dusty, sophisticated wine. Betz has jettisoned malbec and cabernet franc from his blends (as of 2008) and I believe this is the wine that confirmed that decision for him. It’s as surefire ageworthy as any young Washington wine I’ve ever tasted. Though the winery mailing list is closed, these wines do appear in select wine shops, so check with your favorite retailer or give the winery a call for details. 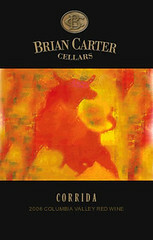 Brian Carter Cellars 2007 Corrida ($35). This inaugural release of Brian Carter’s “Spanish Style Blend” is 70 percent Stone Tree vineyard tempranillo. Carter (like Betz) is a supremely skillful and thoughtful blender, and confided that he decided not to bottle a straight-up tempranillo because he likes to “think about the attributes of a wine – what can be improved without taking away the base varietal character.” In this instance, the blend includes 14 percent merlot, 9 percent grenache (garnacha), and 7 percent cabernet sauvignon. This is a mouth-watering bottle of wine, a perfect mix of berries, light chocolate, spice, mint, and bacon fat that lingers happily in the mouth demanding the next sip. Both of these wines improved significantly after 6+ hours of breathing time. Your post made me remember something I'd been meaning to comment about. Wine writers need to show in their writing something about character and worldview, as well as methodology. If I don't think someone knows much about the world, i probably don't care about their wine opinions either. Austin - I think that's a really important observation. Because wine itself is so complex and layered with meaning, reference, history and art, I think that the writing about it should reflect some of the same. As you say, something about character and worldview - in other words, use the wine intellectually in the same way it works in a dinner party. It loosens the conversation and liquifies the flow of ideas. Your argument for tasting at home via drinking (part of) a bottle (presumably not the whole thing, if you plan to recall your impressions or repeat the action very often) makes a lot of sense as an ideal. Unfortunately, it remains an ideal for those of us who cannot or do not choose to purchase all of the bottles they want to taste. Do you not finish many bottles? Have company over for dinner or tasting often? Live with multiple other wine-imbibers? Erika, I recognize that due to my longevity and also my connections to the print world (newspapers, magazines and books) as well as this blog, Twitter and Facebook, I have better access to wine than most bloggers. I generally taste wine in peer group flights, and return to them over a period of many hours, often days. I share the open bottles as much as possible with as many friends as possible, but inevitably, some wine does get dumped (but only after it has been thoroughly tasted and written up). C'est la vie.